There’s little question that Quest has found a place to spend the rest of the summer, as the location data from her transmitter continues to place her on Cape Cod. It’s an attractive spot for a Peregrine. Prey is plentiful, because of the high concentration of shorebirds. It’s also a migration route for other birds, so getting food is probably not too hard for her. That’s an important consideration for a young bird like Quest, who is still honing her hunting skills. Thank you Lyn and Bill for providing us with a terrific account of Quest on the hunt! Knowing that she’s feeding herself by stooping on prey is welcome news. Birds like terns are relatively slow, abundant targets, and a single successful hunt could provide enough nutrition for a few days. And since there are a lot of them around, she might just stay until the birds embark on their winter migration. 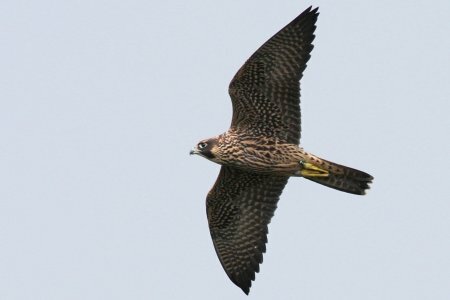 If she continues to feed herself successfully there, it could be a month or more before she makes any significant moves, likely following her prey as they head south. It’s been a while since we’ve posted news about the relocation of Mariah’s nest box. You may recall that this past June Kodak announced that it would need to remove the nest box in order to avoid harm to Mariah, her offspring, or the dozens of workers who will be restoring the deteriorating masonry on the Kodak tower over the next three years. 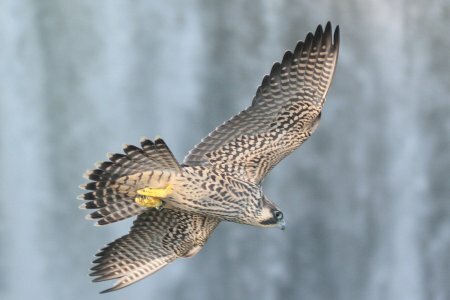 Kodak is working with the Rochester Falconcam and the New York Dept. of Environmental Conservation to maximize the chance of a successful relocation. Last week we took the first step in the process. Falconcam team members fal-Kenn Martinez and Jim Pisello were on hand to supervise and assist as a special team hired by Kodak disconnected the nest box from the steel brackets that held it against the Kodak tower for over a decade. Jim has posted a heartfelt account of the removal activity on his blog, Peregrinations. 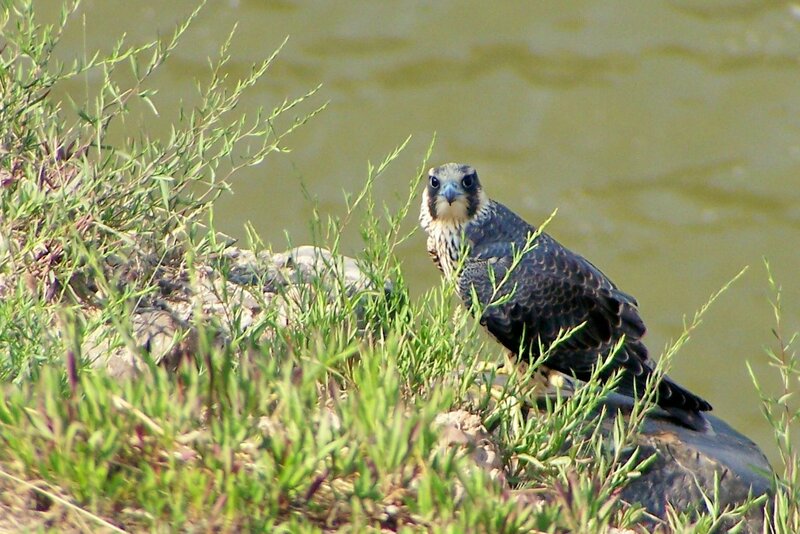 The Rochester Falconcam’s Nest Box Relocation team has been busy touring some potential relocation sites. A couple we’ve seen so far are the First Federal Plaza and the High Falls Brewing Company. In the next couple of weeks we hope to tour several more, but the team is still engaged in discussions with a number of property owners, and the DEC must certify the sites for their fitness to host a nest box. It may seem that the pace of the relocation is a little slow, but things are progressing as fast as we can move them in light of the busy schedules of those involved in the relocation, and the many complexities of this important project. We’re happy to report that we’re still on schedule to begin installing new nest boxes in a couple of weeks, though no date has yet been announced. The biologists at the DEC tell us we still have plenty of time to get the boxes in place, so we’re looking forward to taking the next steps to erect a couple of new penthouses for Mariah to choose as the nursery for her family in 2009 and beyond. Quest continues to enjoy her time at the Massachusetts shore. She spent the past week exploring up and down State Route #6 on Cape Cod, where she is presumably dining on a smorgasbord of shorebirds. We need to invite Shawn to spend some time with us at the High Falls next June or July! Many thanks to Shawn and the Massachusetts Audubon Society, as well as Mike Amaral at the US Fish and Wildlife Service, and Barbara Loucks for connecting the dots needed to identify Quest. Quest looks great, and she doesn’t appear to be in any hurry to leave. It’s likely there’s plenty of prey nearby, and hopefully few predators. It’s possible she could spend the rest of the summer where she is. In any case, we’ll keep watching to see what her next move will be. Quest continued her eastward trek in August, reaching the Massachusetts coast in the first week. She looks like she’s taking a little vacation, visiting tony Martha’s Vineyard, Nantucket and Cape Cod. We’ve omitted some data points with signals that weren’t as strong (keep reading for an explanation), but the majority of data indicate that she’s having a great time exploring the far eastern reaches of the US. Most of Mariah’s offspring whose locations are known– and all that previously had transmitters– went north or west. So Quest’s eastern movement is an unexpected surprise. By the way, it looks like our earlier announcement that she’d flown north to Maine and Quebec may not have been accurate (sorry about that!). The data placing her there is included in her August travels, but its reliability is questionable, based on the transmitter’s signal strength at the time those data were received. It’s possible that she headed north, but since all the rest of the data for the month so far puts her firmly in the Nantucket/Cape Cod area, we’re skeptical of our earlier announcement. 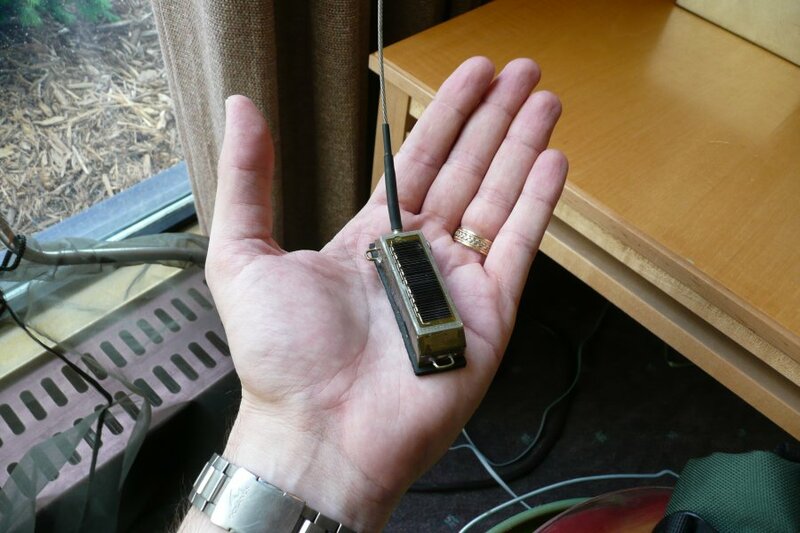 Quest’s satellite transmitter has a small battery that is recharged by a solar panel mounted on top of the transmitter body (here’s a picture). The battery supplies power for the radio-frequency transmitter that sends its signal to a bunch of satellites orbiting the Earth. To save power, the transmitter only sends data for a few hours at a time. Then it shuts down for many more hours. This “transmit and rest” process is called a Duty Cycle. Its timing was programmed into the transmitter before Quest received it. The power of the transmitter is pretty low– about 100mW– so the signals that get up to the satellites may not always be very strong. The variability in the signals, differences in terrain, even local weather and time of day can create uncertainty about the accuracy of the data. So each time the satellites receive data from the transmitter, they assign a confidence value to the location based on the strength of the signal and other factors. The data we receive includes the location information, and also the confidence value assigned to each piece of data. We try to post the data with the highest confidence levels, but sometimes the only data we get in a duty cycle is of questionable accuracy. So, it looks like Quest really can’t go much farther east, unless she hitches a ride on a fishing boat or a cargo ship! It’ll be interesting to see what move she makes next. We’re happy to offer the first of what we hope will be twice-weekly updates on Quest’s travels. Since we have some older data we thought we’d show you where she’s been, then work our way forward. So our first map plots her July journey. As you can see, Quest spent most of her time hanging out in Rochester. In fact, for the first four weeks the strongest data we received placed her in and around the downtown and High Falls areas. Then, at the end of the month she decided to head east. In just a few days she made it all the way to Duanesburg, just east of New York’s fabled Leatherstocking region. That’s what we at the Rochester Falconcam like to call good flying! You are currently browsing the Imprints blog archives for August, 2008.